Ubisoft is giving away DLC for The Division inspired by the game’s just-announced live-action digital series, Agent Origins. 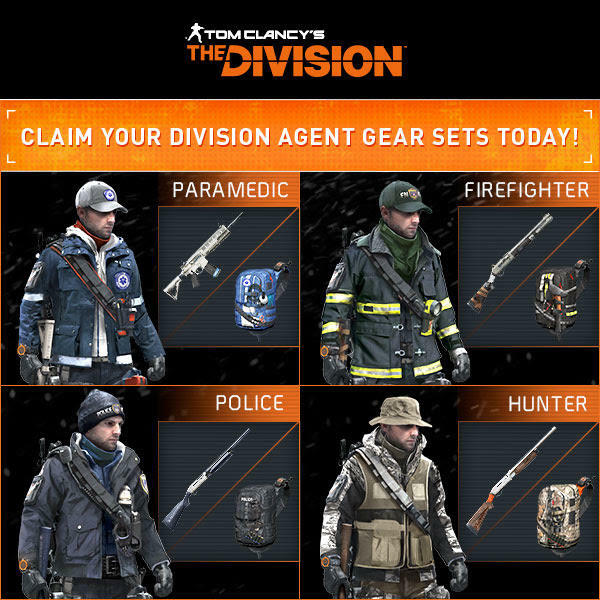 The video series follows the stories of four Division agents, and likewise, the free DLC is themed around four characters: Paramedic, Firefighter, Police, and Hunter. As explained on Ubisoft’s website, the gear sets give your character a new look and some extra skills. To claim the free content, just head to this website, choose your platform, and redeem the code “AGENTORIGINS.” You’ll then receive an email that explains how to redeem the gear. Note, however, that you can’t redeem the content until The Division launches in March (via GameZone). The Division’s closed beta begins on January 28 for Xbox One owners who preordered the game, while PS4 and PC users can get started January 29. The beta ends on all platforms on January 31.